Pan’s Labyrinth (Spanish: El laberinto del fauno, “The Faun’s Labyrinth”) is a 2006 Mexican dark fantasy film written and directed by Mexican filmmaker Guillermo del Toro. It was produced and distributed by the Mexican film company Esperanto Films. 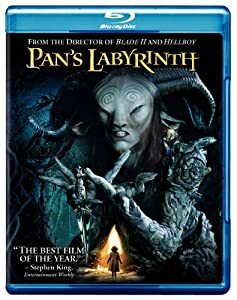 Pan’s Labyrinth takes place in Spain in May–June 1944, five years after the Spanish Civil War, during the early Francoist period. The narrative of the film interweaves this real world with a fantasy world centered around an overgrown abandoned labyrinth and a mysterious faun creature, with which the main character, Ofelia, interacts. Ofelia’s stepfather, the Falangist Captain Vidal, hunts the Spanish Maquis who fight against the Fascist reign in the region, while Ofelia’s pregnant mother grows increasingly ill. Ofelia meets several strange and magical creatures who become central to her story, leading her through the trials of the old labyrinth garden. The film employs make-up, animatronics and CGI effects to bring life to its creatures. Del Toro stated that he considers the story to be a parable, influenced by fairy tales, and that it addresses and continues themes related to his earlier film The Devil’s Backbone (2001), to which Pan’s Labyrinth is a spiritual successor, according to del Toro in his director’s commentary on the DVD. The original Spanish title refers to the mythological fauns of Roman mythology, while the English, German, and French titles refer specifically to the faun-like Greek character Pan. However, del Toro has stated that the faun in the film is not Pan. The film premiered at the 2006 Cannes Film Festival. It was released in the United Kingdom on November 24, 2006. In the United States and Canada, the film was given a limited release on December 29, 2006, with a wide release on January 19, 2007. Pan’s Labyrinth has won numerous international awards, including three Academy Awards, three BAFTA Awards including Best Film Not in the English Language, the Ariel Award for Best Picture, the Saturn Awards for Best International Film and Best Performance by a Younger Actor for Ivana Baquero and the 2007 Hugo Award for Best Dramatic Presentation, Long Form.